New Year’s resolutions that I make for myself tend melt away long before the Midwestern snows, so this year instead of resolutions for my own self-improvement, I have made a short list of Scottie-based resolutions. I think I stand a better chance of keeping resolutions on behalf of Scotties. Many of you already do a great deal for Scotties, both for your own Scottie(s) and for Scotties as a breed, but perhaps the idea of a Scottie resolution list will encourage us all to reassess each year what changes to make to our current regimen that would further benefit our own Scottie(s) and Scotties as a breed, too. CLEAN MY SCOTTIE’S TEETH TWICE A DAY. I know too well that keeping my Scottie’s teeth clean is not merely cosmetic: teeth with tartar and plaque are germ traps that can leak bacteria into your Scottie’s system, doing damage to their major organs. I have all the equipment—tooth brush, paste (poultry flavored! 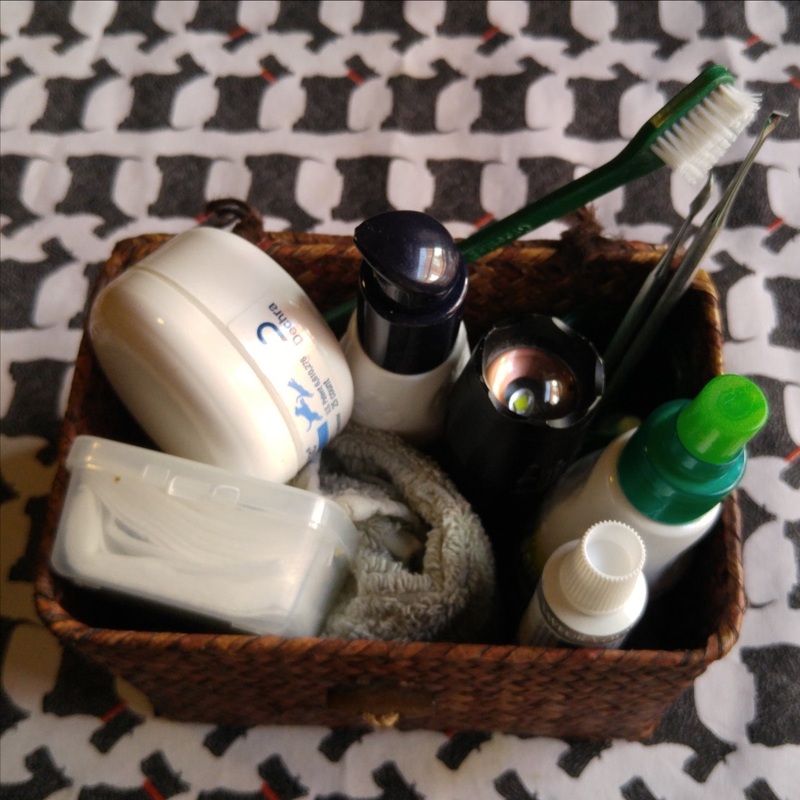 ), gel, spray, wipes, finger brush, scalers, you name it—and I’ve put them all together in a small basket for ease of location, but do I use them every day? Only in fits and starts. Our holistic vet checks our Scottie’s teeth during every visit and shows me which areas need attention. After our appointment, I resolve once again to take better care of my Scottie’s teeth. I’ve had Scotties who did not have the same tendency that our current Scottie, Hemingway, has for tartar and plaque buildup. Some of those Scotties had sparkling clean teeth because they were on a raw diet, others’ teeth were easier to keep clean because, I guess, they simply did not draw the same genetic predisposition towards buildup on their teeth. Hemingway, however, can not tolerate a raw diet or even an occasional raw meaty bone for chewing, because these cause him digestive upsets. And I personally do not trust Scotties with the various dental and other commercially available chews—I’ve heard too many horror stories of chunks of these chews having to be surgically removed from Scottie digestive tracts. Our big-toothed terriers are such aggressive chewers! So here’s my plan, and just in time for National Pet Dental Health Month: Brush Hemingway’s teeth every day after breakfast and again right before bed, and slowly begin also to scale his teeth, something our holistic vet has shown me how to do. If I don’t have success as judged by our holistic vet at our next appointment, I’ll schedule a professional cleaning for Hemingway right away. He’ll have one this year in any case, to get a thorough under-the-gum cleaning and careful full-mouth and throat check for any growths. Does Hemingway enjoy this new regimen? Not especially, though the poultry-flavored toothpaste is a big hit, but unfortunately not very effective at removing tartar. But over the last month, Hemingway has come to dislike the regimen less. I’ve taken it very slowly, being careful to watch his behavior for cues that he’s had enough, and have introduced the scaling at a snail’s pace. If the products I’m using (a gel or spray) allowed a treat to be given afterwards, I know this would make Hemingway happier, but instructions specify no food or water for half an hour after. So instead I spend a few minutes after we’re done telling Hemingway what a wonderful boy he is, scratching his back and massaging him, which he really likes. So far, I’ve kept to my resolution, and like all habits, I’ve begun to feel uncomfortable if I realize I’ve forgotten to do it. The tartar-loosening gel I’m using was recommended by our holistic vet, but I’ve also ordered a different gel from a list of recommended dental products for dogs that I recently found online. The list was compiled by the Veterinary Oral Health Council. You can find it here (scroll down to the end of the list for oral gels and sprays). I’m also intrigued by the list of HealthyMouth® chews and treats listed just above the oral gels and sprays; these will be available sometime in 2019. Stay tuned. 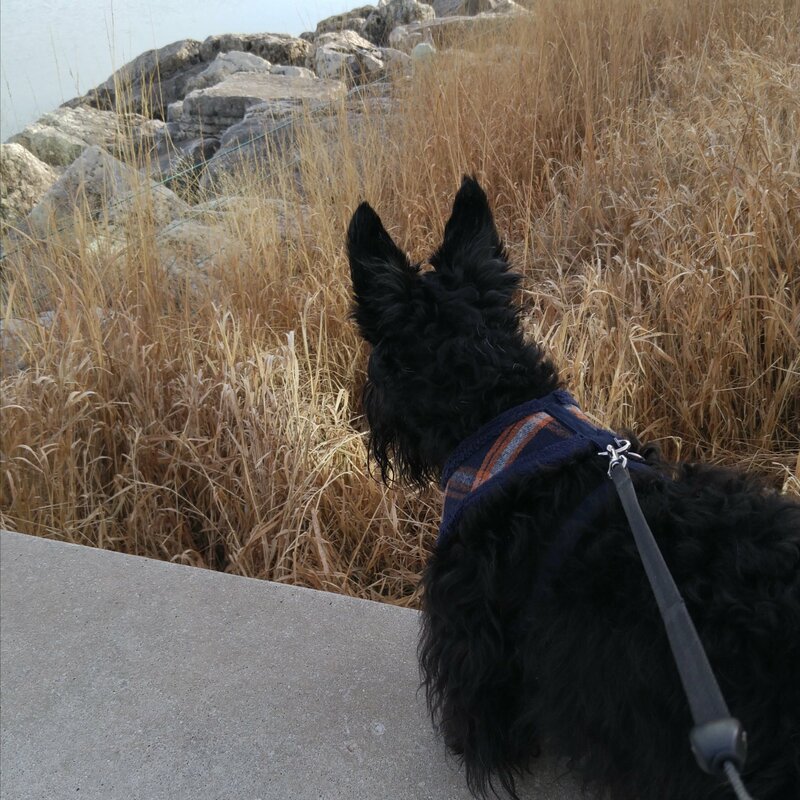 TAKE MY SCOTTIE FOR A HALF-HOUR WALK EACH DAY, WEATHER PERMITTING. We live in a three-unit condo in the city of Chicago, and although we have a fenced-in back yard, we always walk our Scottie for elimination, and for safety’s sake he is in the back yard only when we’re with him. So taking him for a walk per se is not the issue: we walk with him four times a day, every day, rain or shine or freezing cold. But these walks, especially in the last year, have been shorter than ideal and not varied—to the end of the block and back, and maybe then also to the other end of the block and back (we live in the middle of a long city block). For the last several years we’ve had two elderly Scots who could not tolerate much more than this, and near the end of their lives, not even that. In addition, both of our elder Scots needed medical attention several times each day, and so dear little Hemingway, who thrives on longer walks, was getting less attention than he should have had. After we lost one elder Scot a year and a half ago, and then the other at the end of November, I was determined to make this up to Hemingway. Hemingway and I happily took up this resolution in the new year: Chicago had unseasonably balmy weather early in January. We walked usually an hour each day, often along the shore of Lake Michigan, and he was also getting around-the-block elimination walks. We both loved this schedule. Allowing your Scottie ample sniff-time on walks is crucial to their well-being: dogs’ primary sense is smell, not vision. And so since these walks were primarily for Hemingway, not me, I allow him to sniff whatever he feels like sniffing . . . up to a point. 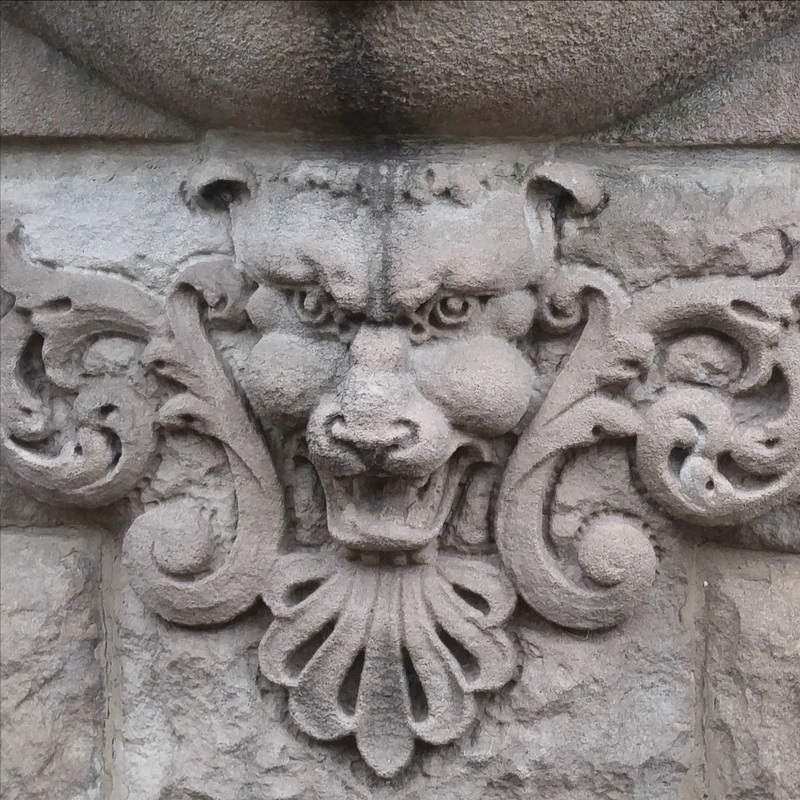 I’ve developed some tactics to keep myself from dying of boredom: I search for interesting rocks to take home, or search the facades of buildings for architectural details to photograph. Sometimes I scan the environs for a place to set Hemingway up for a photo that I post later on Facebook. But eventually I become bored, standing in the same spot where Hemingway has his nose glued to the ground. I allow up to a minute for him to sniff one spot, and if he doesn’t disengage, I give him a signal of two short toots on a dog training whistle I purchased for this purpose. He’s a smart boy and has learned quickly that this means we’re moving forward. Does he stop almost immediately again? Often, at least if it’s still early in the walk. As the walk progresses, however, he becomes less intent on sniffing and more willing to keep moving for longer stretches. This allows us both a chance for better exercise. I’ve also resolved to vary our walks for Hemingway’s sake: new smells! Not only do we take different routes through the neighborhood, but we’ve also ventured out to lakefront parks in neighboring suburbs. This variety has been a big hit with Hemingway. His excitement when he gets out of the car is unmistakable. Alas, as I write this newsletter, we’re back to a wickedly deep freeze with wind-chill temperatures in the 20s and even 40s below zero. Such weather is not safe for human or dog beyond a few minutes, so we’re taking a “weather not permitting” hiatus from our longer walks. But I’ll not forget the benefits we’ve both already received from these walks, and we both are eager to get back out there again as soon as the weather backs off from brutal. DO MORE FOR THE SCOTTISH TERRIER BREED. Hemingway is our ninth Scottie. My husband Jim and I have for the most part adopted rescue Scotties, many of them middle-aged and older, so since 1988, the year I acquired my first Scottie, we’ve had a lot of Scotties join our family. Scotties have changed my life; I suspect you feel the same way. For that reason I feel I owe it to the breed to do something to help them live healthier, happier, and longer lives, and to help all Scotties find a loving home. In the past I’ve been an active member of the local regional Scottie club where I served on the board and as newsletter editor for many years and was a foster home for rescue Scotties, and I was a member of a local collector’s club that promoted fellowship between Scottie owners and also raised money for rescue. I’ve donated a good deal to rescue for auctions, but felt last year that I wanted to do more. For me, the Door County Scottie Rally is a perfect fit because its mission (see above) aligns with my interests, so last year I volunteered to do more for the Rally than previously. I gave a presentation at the 2018 Rally and showed up early to do whatever needed to be done (I sliced more turkey than I’ve ever seen in one place! ), and also worked wherever needed during the Rally. For me, this was a bit of a stretch, but I so enjoyed it and felt so good about my participation that I’m doing the same again this year (presentation and pre-Rally volunteering), though with Jim and Hemingway in tow for the Rally this year (I went solo last year), I’ll cut back a bit on volunteer work during the Rally. I’m adding this year being the editor of this newsletter. Though I know so many of you do so much more than this, this amount is right for me. It will be a bit of a stretch again, but I feel I owe it to all Scotties to do as much as I can without jeopardizing my commitment to doing the best I can for my own Scottie. What can you do for your own Scotties and for all Scotties?That’s for you to determine. You know best what your own Scottie needs to make him/her happier and healthier. And as for what you can do for all Scotties, your own skills, talents, available time, and resources will determine that. I went with my own strong suits, writing, editing, and presenting, and liking to roll up my sleeves to work at tasks someone else determines in a place where I’m needed. Many of you have amazing talents and skills I never will have. I’m always amazed by people who can make things with their hands, beautiful Scottie crafts that can raise money in an auction, or people who have organizing or people skills I lack, but there are so many other options. It’s not too late to make your own mini-list of Scottie resolutions for 2019. I’d love to hear what resolutions you make for this year.